We live in times when national sovereignty is being eroded in favor of global capital. Syriza plans to continue with austerity and has made no serious plan B. All actions taken so far reveal that Syriza intends to continue with the austerity program and in the summer Greece will probably sign a new contract of continued austerity. The question remains whether the people will rise against the loss of sovereignty. This interview was conducted on April 1, 2015, with Dimitris Kazakis, leader of the United Popular Front (E.PA.M). The party opposes austerity and was founded in 2011 by people who participated in anti-memorandum demonstrations in Greece. 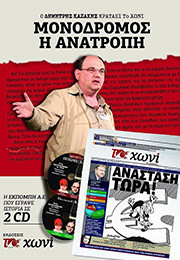 Kazakis is a socialist economist who worked in the private sector in the past. The interview has been amended and shortened. Joshua Tartakovsky: Do you think that the current government has some kind of plan B in mind or are they just trying their best? Dimitris Kazakis: I don’t think they even have a plan A. In the first week after the elections, they tried some general idea, like the European Convention on debt issues. The European Union rejected it so they [the Greek government] abandoned the whole idea. On the second level, they tried to negotiate some kind of elimination of debt, but nobody wanted it, and they did not want to go into a confrontation with the lenders, so they lost ground. Since the agreement of February 20, the Greek government abided by the rules of the loan agreement. The agreement of February 20 had contradictions in it. It was obvious from the beginning that Greece could not satisfy both the troika and the people. Still, the fact that [Prime Minister Alexis] Tsipras brought the issue of reparations from Germany for the World War II occupation seemed to suggest that he is trying to mobilize the people. If you see the declarations, you will find out that according to Tsipras and his government, the German reparations are not a legal issue between Germany and Greece, but an ethnical issue. The way Tsipras is pushing the German reparations issue is to close it. But why would he bring up the question of reparations in the first place? Is Prime Minister Tsipras not seeking to effect some kind of confrontation? Because of the people. The Greek people expected too much from the new government. And they have to put up a theater performance for the Greek people. So that the average Greek citizen can say, «Let’s wait for three or four months to see what is going on with the government,» because the government and the media say they should wait for three or four months because then people will see that there will be a confrontation in midsummer. I don’t think there will be a confrontation. In midsummer, we will see the signing of a new agreement. We are going for the worse. Yes. He says that. But give me an example of the propositions that the Greek government gave to the Eurogroup that are outside of the commitments that were already signed in April 2014 in the last memorandum. What they are trying to do is to convince the people that by doing that, by fulfilling the commitments of the last policy, they are changing policy. That is nonsense. Still, the government must know that if it continues in the same path of austerity, its political future is finished. So why would it commit suicide like that? They will create a new government [and break up with the left flank of Syriza, JT], a national coalition government, with To Potomi, with parts of Pasok and New Democracy and with Golden Dawn, saying that there is no other way. But Syriza must know that they won’t be voted in again if they continue with the same austerity. Yes, but I think that they might create a special situation here in Greece in order for the people to be frightened and probably they will form a national unity or interim government like the Papademos government we had in 2012. The actions Mr. [Yanis] Varoufakis seems to be taking in favor of remaining in the euro do not match what he describes in his book, The Global Minotaur, on the failure of capitalism. How do you explain this? Mr. Varoufakis has a position that didn’t alter since 2011. The main position is that you can forget about Greece, because either you can have a European solution or no solution. So whatever you say or whatever you analyze, when it comes to choosing which way to go, actually he will chose – because he believes it – the European way. And there is no way inside the eurozone to find a solution, especially for Greece. Well, yes. We have more than a 324 billion euro public debt and we are paying each year around 30 billion in monetization of that debt. Who is going to give us the money? Nobody. Why would they? For example, if you get rid of the debt and say goodbye to the euro, you can go to Russia or China and say, «Can you supplement our currency deposits for our exterior balance?» They will probably say, «OK, let’s discuss. I can give you the money; what can you give me?» But inside the eurozone, Russia and China know that they cannot provide directly to the government itself. They must negotiate through Berlin or Brussels. How much support do you think Tsipras has within Syriza if he were to sign a new austerity memorandum? In my opinion, Tsipras has control of around 55 percent of his own MPs. Would they agree to the next memorandum? That’s why they don’t want the agreement of February 20 to go through parliament. They are frightened of their own MPs voting against it. What do you see as a possible solution to the current crisis? But what would you do to prevent speculation against the drachma? Capital flight? First of all, we have to implement capital controls. It’s not a big deal; in Cyprus you see how even the European Bank put in capital controls, of course in favor of the big capital in Cyprus. 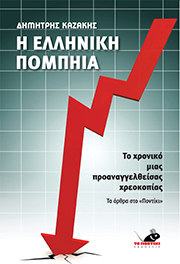 We can do it in favor of the Greek economy and of course in favor of the majority of the Greek people. At the same time, there will be no speculations because we need around six to eight months to import the new national currency and for the first six to eight months we will have the euro. Who is going to speculate against the euro? But the day the drachma comes in, there will be speculation. To speculate against the national currency, you have to find it first freely in the foreign markets. Give me one reason, for the new government and the state’s central bank, to place the new currency in the foreign markets? We are not going to support foreign speculation by selling our new national currency. We can say that after two years, there will be a meeting for stabilization and development of the Greek economy and then we will make our national currency available for purchase only by those who want to buy our currency for more than 4 billion euros. That’s the good thing about implementing or having a new national currency, the freedom to choose what to do with it. That’s also the big mistake Argentina made. Repudiating 70 percent of the public debt was good. But what they didn’t think about was the currency. Change the currency. Say that you can provide your economy with a new peso. Like for example, Chavez did with the new [Venezuelan] bolivar, and stop the speculation for some time in order for your own economy to stand on its feet and develop. In the scenario you put fourth, how would you revive the economy? What would be the engine for growth? Tourism? New infrastructure? You can have special production spheres. We need to have around 30 to 35 percent of GDP in industry and agriculture. Right now, both are less than 16 percent of the GDP. Through industry and agriculture we can have the best performance for the benefit of our economy. We can provide the people with stable employment and growing wages. We can have higher wages every year when we invest in the productivity of labor, not in the price of the labor. The two are very different. You can have a competitive economy without having to perform austerity measures against the working people. Can the Greek industries compete globally? Also, if Greece defaults, it would not be able to trade its agricultural products with Europe because there would probably be sanctions. Right now, more than 60 percent of the agricultural production of Greece is traded outside the European Union. We are losing every year about 5 to 10 percent from commerce inside the eurozone. So actually, right now we don’t care about losing trade in the eurozone. The motivation and the main force of our economic proposal is to improve the wages of the working people. If they have enough money, they can buy what they want and provide for the development of the economy. At the same time, the economy will provide them with more leisure time through the development of productivity. By giving leisure time, people can get involved in political activism and get involved in running the country. Do you think that there will be a popular uprising in June or July? We are working on a particular side of action, that’s all I can say. No one knows the future, but with the way things are going now, what do you see developing this year? Either we will lose our statehood and become the first state under international law and in the international community that gave up its statehood, or a revolution. No middle ground. Would you say that capitalism is in crisis globally and that it may have a few more decades to go, perhaps even less, or would you say that what we are seeing around the world are local problems? No. It’s a world situation. We have what economists call the absolute surplus of capital that cannot go into the economy so they are searching in a destructive mode to provide for more profit. And that’s why the whole system is becoming more barbaric. What we have today is a capitalistic feudalism, and instead of the old lord, we have the lord of money, the banker. We are seeing more and more Western democracies turning into police states in various places. Not even a police state, because a police state needs to be first of all a state, an organized state. That is the opposite of what the capitalist elite want. If you have an organized country, it’s bad for them, because they cannot take over easily. So they want to destroy the state and its sovereignty. But it seems that the world is definitely moving in that direction of barbarism and feudalism you describe, so is there any way to fight that? The Greek people have to make the first move. And that is to decide to fight for their own country. And of course, you start from the basics. The global system denies even the natural rights of the French Enlightenment. We do not see bourgeois forces fighting alongside the people, because the middle class actually is dissolving under the regime of the bankers. Now people can have a new type of state based on democracy that all the philosophers discussed. It’s something that is quite practical and it’s something that can be implemented in a record time, because of the technology and the possibilities of communication we have. That’s why the most important action to take now is to fight for national sovereignty and democracy. 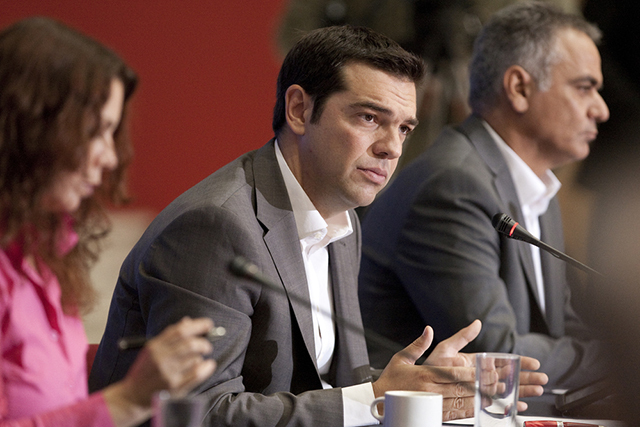 What’s the role of international solidarity in the case of Greece? Does it even make a difference? This entry was posted on Πέμπτη 21 Μαΐου 2015 at 16:58 and is filed under Συνεντεύξεις - Ομιλίες. You can follow any responses to this entry through the RSS 2.0 feed. You can leave a response, or trackback from your own site.